I saw this PT-82 in a local Charity Shop (Thrift Store for those in the US) and wanted it, but I was torn because I didn't really want any more junk in my life and it was looking a bit rough. So, I left it and went home. 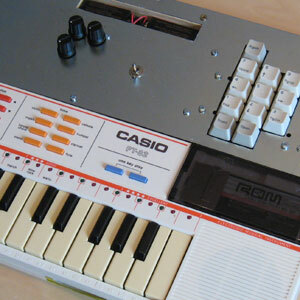 At home, Google told me that it was considered a classic of Casio 8 bit technology before the famous SK-1 came out. So, I weakened and next time I was passing I went in to the shop and bought it. I had been thinking for a while about how the LushOne could be used as a way of modifying simple keyboards. There are a lot of Casio circuit bends out there, but at least for the PT-82 (which doesn't bend as easily as the SK-1) they didn't seem very exciting. The useful mods you can make without adding proper electronics are quite limited. I knew that the LushOne would allow me to modify the sound in a way that was structured and controllable while still being exciting. Despite looking a bit tatty the PT-82 worked fine except for dodgy contacts on the sliding switches. I stripped it back to individual components and washed all the plastics to remove the horrible debris from years of use and adjusted the springs on the sliding switches. After that treatment it looked and sounded fine. 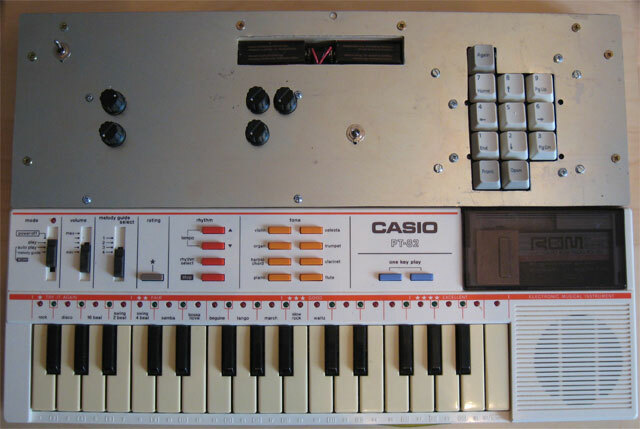 The idea for the build was to use a LushOne base to add a filter with LFO input to the cut-off frequency and a ring modulator with second oscillator input to the PT-82. I couldn't find any PT-82 schematics or service manuals but it isn't a very complicated circuit and with a scope it was quite easy to find these signals. The PT-82's audio is not sophisticated. The different instruments are all square waves with different patterns. There is an envelope control that changes the volume of the square wave but this seems to only have about 8 levels. Having found all the signals I wanted I brought them all out to a 25 way D connector on the back of the PT-82's case. I took the signal from the input to the PT-82's amplifier and routed it through the LushOne's filter before feeding it back to the PT-82. The signal is at a lower level than the LushOne expects so I had to tweak the diode gain limiters in the filter to match the lower level. The LFO from the LushOne was hard wired to a control voltage input of the filter. This arrangement means I can modify the PT-82 sound using the LushOne filter and LFO. 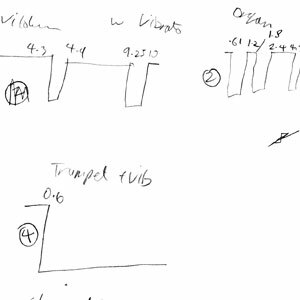 To provide a gate for the LFO I took the envelope signal and put it through a comparator (actually constructed as a schmitt trigger) to determine if the PT-82 was playing a note. 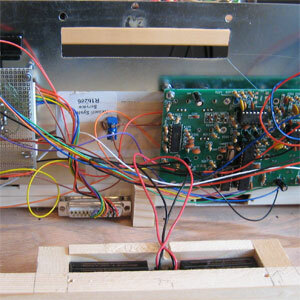 For square wave signals like the PT-82's you can build a ring modulator by exclusive-oring with another square wave signal. I modified the software and hardware for the LushOne's main oscillator to generate square waves that are similar to the patterns used by the different instruments in the PT-82. This is then fed via a switch in to an ex-or function inserted in to the digital signal path of the main oscillator in the PT-82. The LushOne software and hardware is changed so that the oscillators always work in control voltage mode and the the two control voltage gain knobs control the oscillator frequencies. I also wanted to try a push button control to select the LushOne's wave shapes and LFO modes. The existing LushOne LED matrix was replaced with a key matrix from a modified PC keyboard. The LED multiplexing software was rewritten to read input from the key matrix. I wanted hardware that fits neatly with the PT-82 so I designed the layout so that the added electronics fits exactly on the back of the keyboard. Both the old and new components are joined to a common plywood base to keep everything together. All the new electronics are fixed to the front panel. This turns out to be quite complicated. To make everything fit I had to mount a circuit board containing the new ex-or function underneath the keypad in a 3D stack. Everything is linked with connectors to help manage the complexity of the wiring and assembly. On the photograph above you can see the back of the front panel with the LushOne board on the right and the additional electronics and keypad on the left. In the middle at the bottom is the D connector to the PT-82. The finished project is really usable, though the PT-82's keyboard is a bit small for my big hands. I really like the design - it feels solid and looks well proportioned. I an not sure how to decorate the front panel though. Suggestions welcome!